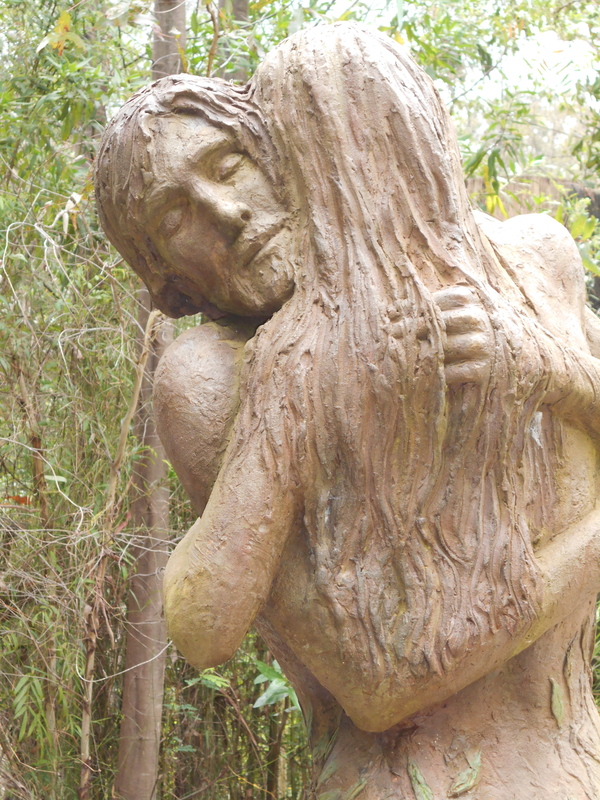 (Above photo is from Bruno Torfs garden in Marysville VIC) Personal relationships with a partner, can be both amongst the most testing and the most exhilarating parts of our lives. In the early days of our relating we may see our significant other through rose colored glasses and we sigh with the wonder that we could ever have been so fortunate and blessed. It’s often called the honeymoon period and for good reason. Several months down the track we may sigh and wonder how we could ever have been so unlucky! How did I end up with this person who is sooooo dis-organised, controlling, apathetic, messy, conceited, jealous, addicted, scattered, mean spirited, on and on; are you adding in your own bits as you read? Of course it may not be this black and white a shift, but as time goes by, we notice the ‘not so good,’ in our partner. Rewind to the early days of your relationship; the things that attracted you, remember……? You were so in love with their spontaneous, carefree nature, earthy beauty, gratitude, positivity, generosity, inclusiveness, warmth, softness, sense of adventure, musical gifts, artistic flair…….. Chances are lots of those traits and characteristics are still there. Have you lost sight of them some where along the way? Or perhaps some of these parts became withdrawn from you because of an arising tension within the partnership. We are creatures of many parts. Part of us can be generous and part mean spirited. Which part do you chose to focus on each and every day? The parts that somehow annoy you or the parts that you like and embrace? Is it possible that we can continue to focus on the positive parts and celebrate and acknowledge these, while at the same time assisting our partner to see the part that is mean spirited? In a loving, non judgemental manner? More interested in assisting them to grow rather than being annoyed because their ‘lower’ behaviour doesn’t give us something that we want? Imagine if you were able to see both ends of the spectrum with your partner, but not be triggered into aggravation / annoyance / pull back, by the parts that may be under-developed. (By under-developed I mean that the person could do some work to find a higher version of themselves with that part – less selfish, more loving.) You could really build on the relationship from there if you both decided that growth was an imperative part of your relationship. PARTS of both of you are higher and lower. How would / do you feel if your partner consistently focuses on the parts of you that are under-developed and constantly lets you know in a way that is judgemental or belittling. It can take time to change our lower behaviours and that is even when we decide by our own volition that we need to. Do you even know what you WANT from your partner? Start to do a little inventory and see where it goes. Be honest. A great way to start is “I WANT,….. I want you to be more considerate of my feelings, I want you to be quieter when you get up in the morning, I want you to support me financially, I want you to hang out with MY friends more, I WANT you to do more around the house, I WANT you to stop cheating on me.” Wonder why we decide that our partner has to be all these things for us? Wanting another to be anything for us is a recipe for suffering. The only person we can change is ME. You can offer your partner some insight into their lower behaviours but if you are attached to them doing things differently (ie the way you WANT them to be) then are you really loving your partner, or trying to force them to change. Offering insight to assist them to grow from an energy of gifting and love or attempting to change them by FORCE to be something that suits your own agenda? And can you be honest enough to own that some of your attempts to shift their behaviour is because it fills some WANT of yours? Look at your partner today. Celebrate their amazing, unique, incredible selves! Isn’t that what you would like in return? How do you feel about a partnership that is based on loving the higher parts and growing the lower? Can you find the courage to hear about your lower parts and be prepared to discuss them in an adult way? Can you imagine how that relationship would evolve? Two people becoming more and more honest and real with each other. Finding higher ways of operating in the world. More selfless and considerate. Self reflective. No hiding from lower parts or false personas. The depth of relating that would open, far surpasses the initial honeymoon period. There would be a deep intimacy. Lovingness, Connection, Gifting, Service to the other. Merging. The first step is Courage. Courage to find and share what one sees in the other and be willing to discuss that and use it as a tool to grow. Have fun! ← Why won’t YOU change?